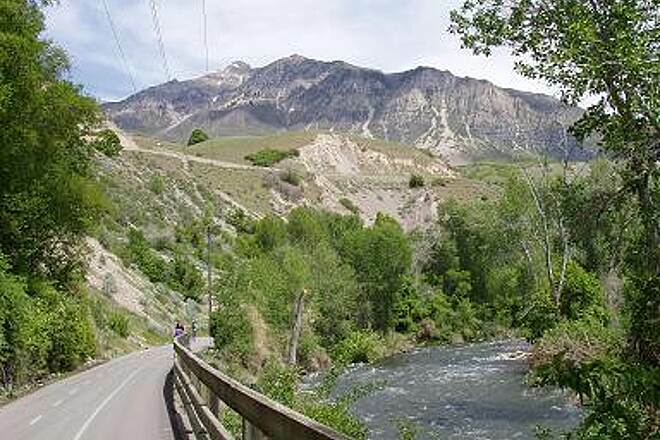 The Provo River Parkway weaves its way through state, city and county parks, as well as residential and commercial areas following the Provo River, then along University Avenue (US 189) to the mouth of Provo Canyon. 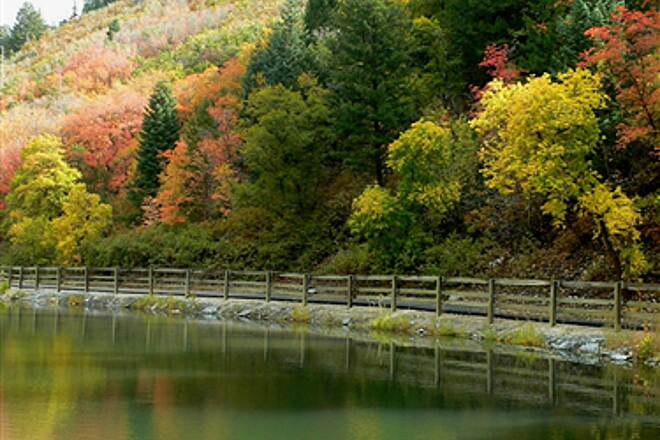 Its 15-mile length stretches from Utah Lake State Park in Provo to Vivian Park in Provo Canyon. At its northern end, the trail passes the base of Bridal Veil Falls for a spectacular view. 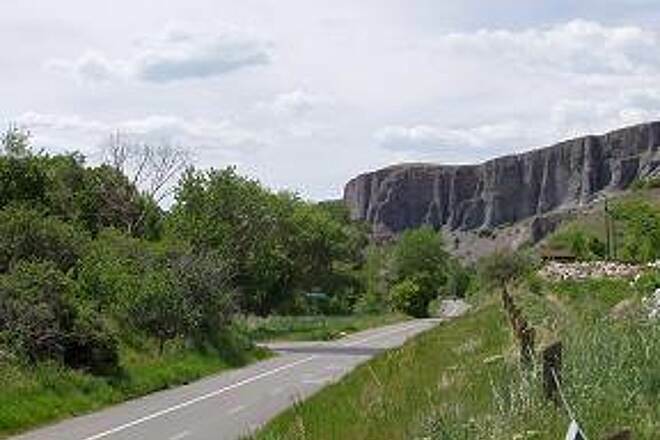 The route is a Class 1, multi-use, gradual inclined, paved trail with a couple of short steep climbs. 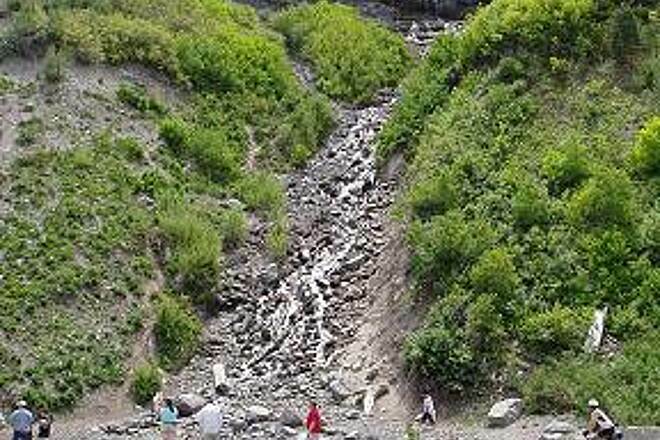 From Utah Lake State Park to the mouth of Provo Canyon, the path is 8-10 feet wide and nearly flat most of the way. In the canyon, the surface widens to 16 feet, and rises a little more steeply. There are some surface street crossings and some narrow underpasses. Water, restrooms, parking and picnic areas are available in the parks along the route. 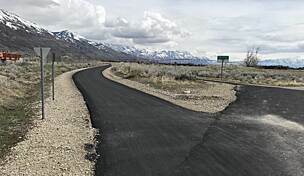 The pathway is also part of a regional effort called the Golden Spoke network, which connects more than 100 miles of paved trails from Provo to Ogden. 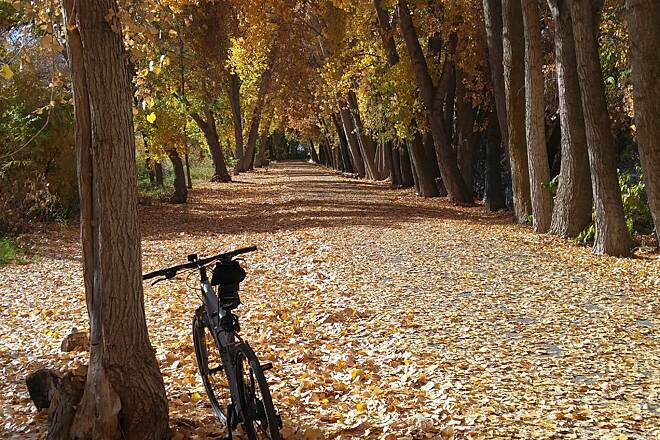 In Provo, many amenities can be found in Utah Lake State Park (4400 W. Center St.) at the southern tip of the trail, as well as camping opportunities. 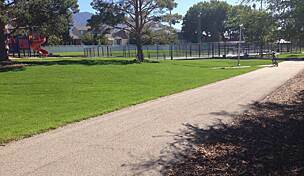 Continuing on the trail through Provo, other options for parking and restrooms include: Fort Utah Park (200 N. Geneva Rd. 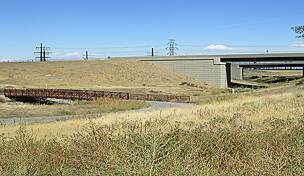 ), Paul Ream Wilderness Park (1600 W. 500 N.), and Exchange Park (900 700 W.). Mid-trail in Orem, parking and restrooms can be found in Mt. 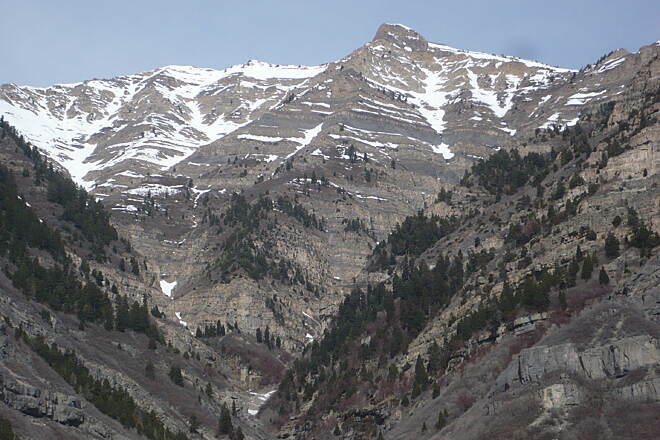 Timpanogos Park on Provo Canyon Road (Highway 189). 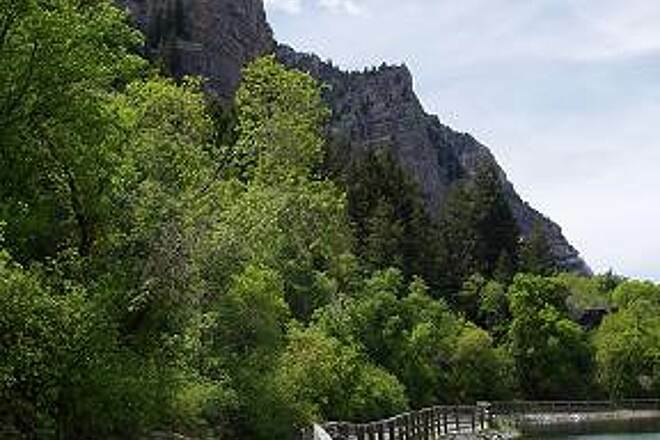 On the northern end of the trail, parking, restrooms, and a water tap can be found in Canyon Glen Park (1501 E. Provo Canyon Rd.) 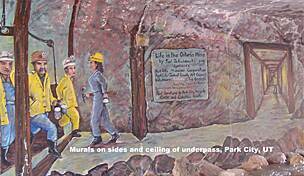 and Nunns Park (off Highway 189); the latter also offers another option for camping. Dropped off a car at Utah Lake State Park and then rode DOWNHILL from Vivian Park. Left at 7:30 pm, took 1 hr 20 minutes. Not hot, little exertion. Sure there's some bumps and underpasses, but they add character to the ride. A cool slice of Provo through river bottoms, backyards, commercial zones, city parks and pastures. Not for serious cyclists but a great way to spend an evening with someone you like to be with. Pedestrians, skaters, dog lovers, couples, families--everyone I said hello to was smiling! We rode this trail a couple weeks ago while vacationing in Utah. Beautiful scenery. Loved the huge waterfall and riding by the rushing river. It is well maintained with LOTS of people using it. We started at the Virgin Park Trailhead. We did not ride through the city part. Drove to the Lake and rode that end also. 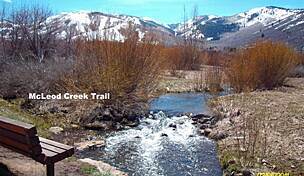 There is a great/beautiful train ride out of Heber City that goes to Virgin Park where the the rails end and the Trail starts. Then it goes back to Heber City. We rode the train, then jumped in our car and drove back to the Trailhead and got on the trail. One can really see the rails to trails concept as the railroad tracks literally end and the trail begins. Fun day filled with historic appreciation! 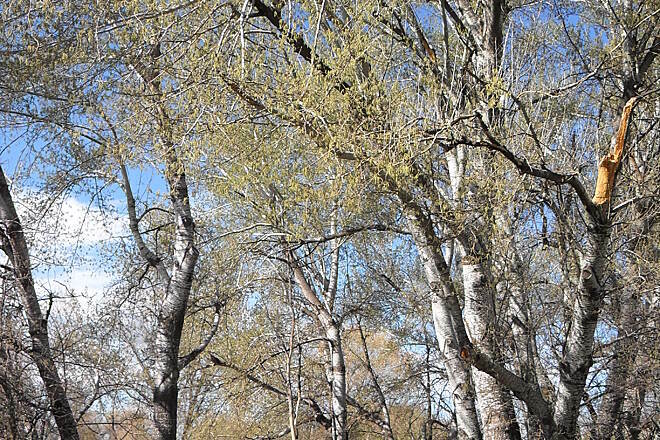 Near the point where the trail reaches Utah Lake, the stand of cottonwood trees along the river is being decimated by beavers. If this continues, what was a lovely wooded trail/river scene will be reduced to an eyesore. Please call the Utah DPR and ask them to remove the beaver to a more remote and less sucecptable location. Scenic with shade. Some spots are unsafe for bikes but I routinely run through at about 10 mph without problems. Great for walking too. For the most part the path is paved and pretty wide with room to pass. However, as another reviewer mentioned before from Geneva for about a half mile East the path is very narrow, unlit and generally unsafe. Whoever maintains this trail needs to at the very least paint some lines or do something. At another point, there is an under pass that cuts nearly 90 degrees. 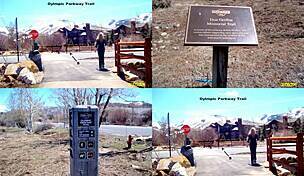 I rode the Provo river parkway trail from Utah Lake to Vivian park on 4/25/2014. 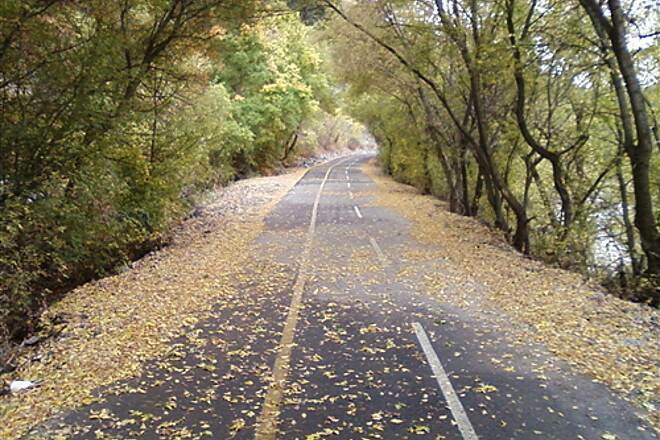 The section from the mouth of the Provo Canyon to Vivian park is spectacular and a great ride. 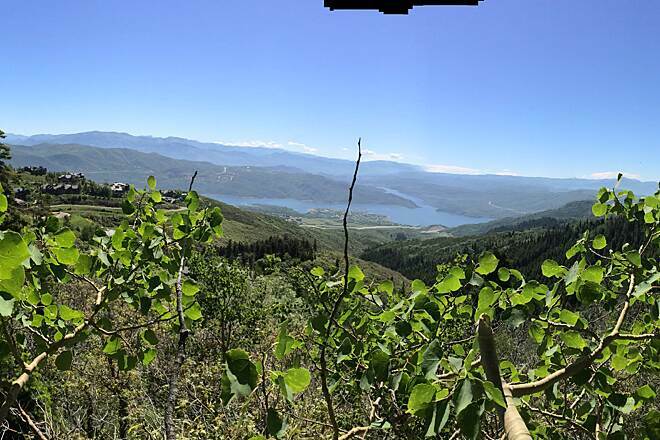 However, the section from the mouth of the Provo Canyon to Utah Lake is pitiful and not fit for riding, in fact I would caution anybody to be very aware when using this section as the trail has huge ruts in the asphalt making cycling very difficult. Even walking and pushing a stroller would be difficult. In addition the sections going under roads are unlit and very dark as well as about 3 feet wide making it impossible for two people to pass while going opposite directions in total darkness. The design of this section of trail is not conducive to safe use. In addition entire corridors are fenced in giving no escape should it be necessary. I hope this section of the parkway is modernized as I wont ride it again until it is. I would be safer to ride in the streets with the cars. Rode this trail August 11, 2012. Loved it. Very scenic and easy to follow. The narrow underpasses or "chutes" mentioned by others are definitely a severe safety problem. We were extremely careful around these spots. Could not believe they built these. They are blind curves and not wide enough. They are only on one end of the trail. The canyon part of the trail is the most scenic. Trail is highly used. We were riding hybrids. The comments about the south end of the trail are valid. The problems may be corrected during the freeway construction. Start your ride at the mall/business center about a mile south of the canyon mouth. You can ride south toward Utah Lake for three or four miles as a nice "flat land" warm-up, turn around and head up the canyon. Since this is a rail-trail the grade is easy. 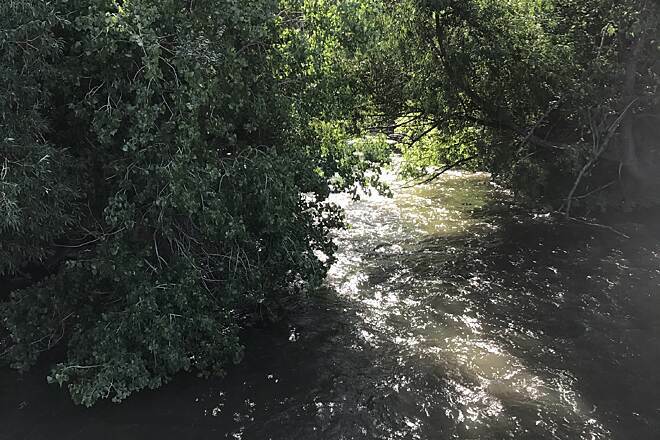 The existing Provo River Parkway Trail has potential safety hazards including narrow passing areas and bridge crossings with short height clearance at I-15. 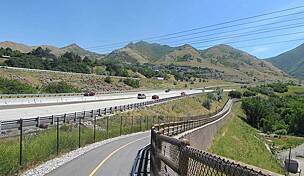 When reopened, enhancements to the trail under I-15 will include a 10-foot-wide, newly-paved trail, an eight-foot height clearance on bridge crossings and lighted undercrossing to improve safety and visibility. 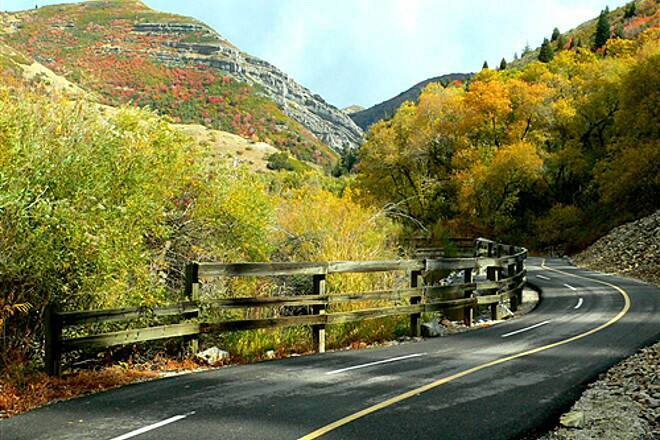 We recently rode the beautiful Provo River Parkway. It is a beautiful ride along the river, sometimes through town and even passing a lovely waterfall. However, there is a safety issue involved which detracts from the pleasure of ridding the trail. The passage ways in the city routing the riders underneath streets, and railroads are not conducive to safe riding. Most problematic are the narrow chutes under the streets. They are NOT wide enough for cyclists to pass each other. The ramps leading into them are short and fairly steep. The approach sometimes involves a blind 90 degree turn into (or out of) the chute! On our ride, a little girl came barreling towards me in this narrow passage way. An accident was avoided only because I yelled at her several times to STOP. It's surprising to have such an unsatisfactory feature on an otherwise beautiful facility. Happily, by mile 5.5, there are no more of them. The concern is this: No matter how careful one is as a rider, a careless person coming the other way can spell real trouble. Also, there is one problem with missing signage. At mile 5.5, the parkway seems to continue under the street. However, it stops shortly thereafter. Fortunately for us, there was a local couple nearby who could direct us to take the street to University Blvd., follow that street for several blocks, and then pick up the trail again. This at least is an easy problem to correct. SIGNAGE is very much needed at that point on the trail for the sake of the out-of-towners. I hope there is a way to pass these comments on. I didn't find one at the web page. This is meant only to be advisory as to potential hazards as we all need to be aware of the need and to make a suggestion which I hope will be take re: signage for the visitors from out of town. 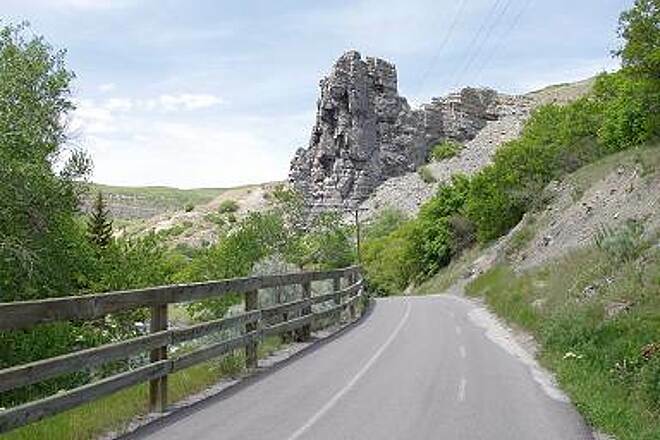 That said, the Provo River Parkway is a very lovely ride, satisfying in many ways and I look forward to revisiting it whenever we pass through Provo. "As a long time resident and heavy user of this trail/s, I feel the need to correct some errors in this listing. 1st, you have the location listed as Provo to Provo Canyon, which is an entirely different trail (21 miles long) that is all paved from the east shore of Utah Lake at the Utah Lake State Park marina thru Provo City then north along the east side of the city to the mouth of Provo Canyon, then east up the canyon past Bridal Veil Falls to the point 2/3rds up the canyon where it stops where the Heber Creeper Railroad ends coming down the canyon. Utah County calls this trail and their section of the trail from the north end of Utah Lake at the starting point of the Jordan River (going north to the Great Salt Lake)the Provo/Jordan River Parkway Trail System. 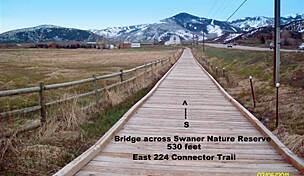 At the Utah County/Salt Lake County line the trail is then designated just the Jordan River Parkway Trail. 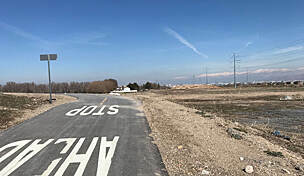 There is 8 miles paved to this county line and an additional 3 miles paved as it enters the south end of SL County for a total of 11 miles on that segment, plus the additional mileages you have listed with new sections being finished all the time. 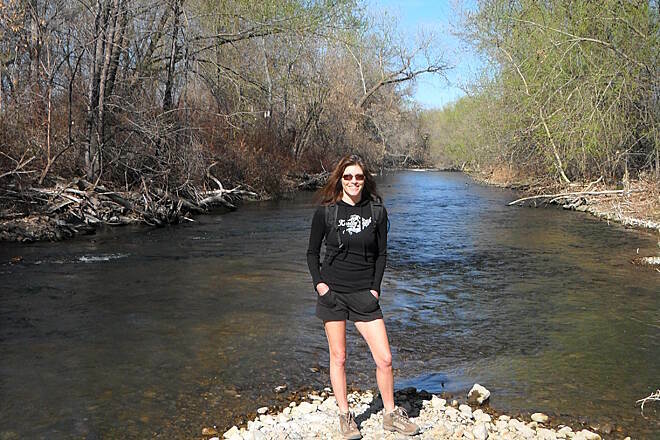 The trails have wonderful views of the Wasatch Mountains to the east." 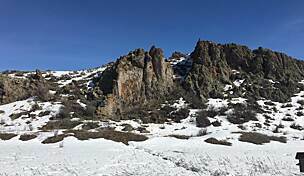 "This is a beautiful trail with adequate length for all of the exercise one could want. The cool canyon breeze keeps you cool even in the summer and the mountain peeks, landscape and beauty is exquisite -- particularly in the fall."